Image caption Pervez Musharraf: "Whatever I did was for the betterment of Pakistan." The trial of Pakistan's former military ruler Pervez Musharraf has been postponed after explosives were found on his route to court in Islamabad. The special court hearing on treason charges against the former president will now take place on 1 January. On Monday, his petition that only a military court could examine his actions was rejected. The charges relate to his decision in 2007 to suspend the constitution and impose emergency rule. 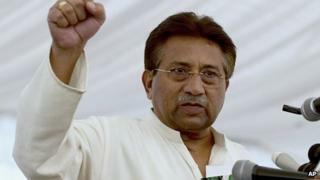 Mr Musharraf, who is on bail in several other cases, says all the accusations against him are politically motivated. The media was disappointed, but Gen Musharraf's non-appearance at his hearing was not entirely unexpected. He has twice been attacked by militants, and was named by the Pakistani Taliban as a prime target earlier this year. Since his release on bail last month, he has not left his residence due to the threats. But there is also speculation that the discovery of a bomb on his route may be a convenient way to scuttle proceedings. No Pakistani army chief has ever been tried for high treason before. And if the case runs smoothly, many other army generals are likely to be dragged into it, a scenario the country's powerful army does not feel comfortable about. The civilian government, which has been dragging its feet on the issue, was forced to institute this case by the Supreme Court under its former head, Chief Justice Iftikhar Chaudhry, who had been sacked by Gen Musharraf in 2007. But Justice Chaudhry retired last month, and it is not clear if the authorities will still want to pursue the case with the same vigour. The 70-year-old also faces separate charges of murder and restricting the judiciary. He is the first Pakistani former military ruler to face trial for treason. Mr Musharraf's lawyer, Anwar Mansoor, told the court on Tuesday that his client could not appear in person because of a heightened security threat. Police said 5kg of explosives along with a detonator and two pistols had been found along the route between Mr Musharraf's house and the National Library, where the hearing is taking place. Police chief Muhammad Asjad told the AFP news agency the material had not been assembled into a bomb. The court granted Mr Musharraf a one-off exemption, but said he must appear on 1 January when charges will be read to him. On Monday, Mr Musharraf's lawyers had argued - unsuccessfully - that as he was the army chief in 2007, only a military court had the authority to try him. But Islamabad's high court rejected the petition. It also dismissed objections over the appointment of judges and prosecutor. The BBC's M Ilyas Khan in Islamabad says many Pakistanis believe the government of Prime Minister Nawaz Sharif - whom Mr Musharraf ousted in a coup in 1999 - is using the trial to divert attention from the problems the country is facing, including a struggling economy and continuing sectarian and other attacks. But the trial could end up creating further problems for the government, he adds, as Mr Musharraf will plead that several other military and political leaders were involved in the events for which he is now being tried. The military is thought to be viewing his predicament with a degree of concern, aware that his case could set a precedent in a country with a history of army rule. After seizing power, Mr Musharraf remained president until 2008 when a democratically elected government forced him to resign. He left the country soon afterwards to live in self-imposed exile in Dubai and London. On his return to Pakistan in March he hoped he could lead his party into elections, but was disqualified from standing and found himself fighting an array of charges relating to his time in power. Speaking last week, he defended his actions during his nine-year rule. "Whatever I did was for the betterment and welfare of Pakistan and its people," he told Pakistan's private ARY television channel. "I will face all cases... I will not run away."